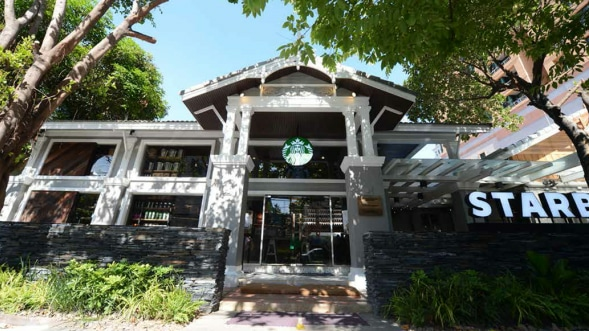 Langsuan is our first Starbucks Community Store outside the U.S. and is the second store certified at the LEED® Gold level for us in Thailand. The project began by having our Starbucks team travel deep into the mountains of Northern Thailand where they stayed with the hill tribes to experience farm life first hand. The spirit of the people, the beauty of the natural surroundings, and the patterns and textures associated with the hill tribes were all translated into the store design. A portion of the sales for every hand crafted beverage served in the store is donated to help the coffee farmers. For more information on the donation, visit our Newsroom.